As Prime Minister Narendra Modi take the target to make India most developed country on the map of globe. Under this scheme he always ready to give different scheme to country mates so that they can benefit of them and grow more. Energy and get have great influence on the economics of a nation as lot of industry depends upon fuel and industry is back bone of any country. So if country has proper fuel resources then growth is sure. By keeping this kind of thinking in mind Prime Minister Narendra Modi launches one of such scheme during his visit to his Lok Sabha constituency Varanasi. This scheme Urja Ganga was launched by the NDA government lead by Mr. Narendra Modi, along with several other schemes recently. On the occasion of the launch Mr. Modi declared his trust factor over the administration on the completion of this project. Around Rs. 5,000 Crores has been invested for this Urja Ganga project, he added while addressing to the people at the launch function. In this scheme a gas pipeline is put which will give piped cooking fuel to populace of this very oldholy place town as wellgiving to millions of customers in neighboring states. In addition, in recent times, NDA government shows keen on launching several schemes and yojana for Indian people particularly for the peoples from BPL (Below Poverty Line) families. 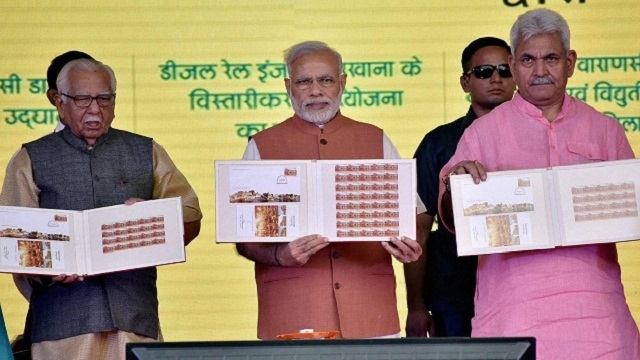 After announcing about the Urja Project, Mr. Prime Minster laid the foundation stone for the second line rail line electrification process in between Allahabad – Varanasi route along by initiating the process for setting up the unpreserved consignment center at the Rajatalab Railway Station. He said to the people that govt is trying their best to fulfill the entire basic requirement and for this purpose he gives gifts of these schemes so that all people can take benefits of basic requirement. He said the real plan of government plan is appropriateimplementation and movingpeople’s lives. For this he gives grand of Rs 5,000 crore for the people of Kashi. In the Urja Ganga a 2540 km long gas pipeline which will guarantee supply of clean and eco friendly fuel to at least seven main cities – Varanasi, Patna, Jamshedpur, Kolkata, Ranchi, Bhubaneswar and Cuttack . This is estimated that project will get complete in 2020, after that people can get gas supply at their houses itself. It will surely give lot of benefits and also help renewal of a number of decliningfertilizerindustrialized units. In this scheme not only houses get the piped natural gas but approximate half a million vehicles to switch over to CNG mode so also the problem of fuel which is big in our country these days.During his this visit modi also put a stone for the 120kmlong VaranasiMadhosinghAllahabad railway line that will cost approximate Rs 750.66 crore. This project is mainly launch to give a major step towards combineddevelopment and expansion of the Eastern region of India. Once this project is completed approximate 20 lakh households will get PNG connections at very reasonable rates and many vehicle convert to CNG mode. The main objective of launching this Urja Ganga gas pipeline Project is to offer proper good cooking gas and to improve the living standards of the people in Varanasi within next two years. Also the gas pipeline project will offers various benefits for the states which is travels and covers millions of peoples in the states like West Bengal, Odisha, Bihar and so. Because of this project about 800 kilometers of pipeline would be putjust only in Varanasi region and profit about 50,000 households and 20,000 vehicles for PNG and CNG correspondingly. The project would also allow the accessibility of approximate 5 Lakh LPG gas cylinders to therustic population in next 5 years. Set up of 20 CNG stations for vehicle is also the part of project to solve the problem of diesel and patrol. This Urja Ganga gas pipeline project would be beneficial for around 20 Lakh families in those eastern parts of the India. Cities like Bhubaneswar, Cuttack, Kolkata, Patna, Varanasi and others would the main recipient of this Urja Ganga Project. In addition to the features included in Urja Ganga Project, current NDA government plans to amend 5 more industry in the routes selected for laying Urja Ganga gas pipeline project. The pipeline would be more than 2500 kilometers long and travels across the 5 states. To enhance the life site of his region Prime Minister Narendra Modi said that this project will be completed in the next 2 years and lot of people will get benefits from this scheme. The respective authority has given budget of Rs. 51,000 crore to complete this project. He expect that this plan will e completed in next 2 years and after that people will get gas at their houses and they will get free from many hassle which they face during the filling of cylinder. Also free from risk related to cylinders. The pipeline network will be used to supply clean fuel to the end consumers in the city. This project will cost total Rs. 51,000 crore and will be total 1,500 km covered long gas pipeline along with gas stations at different locations. People of villages near to the region also get benefited because of this project. And it is assumed that almost all the houses will get benefit from the gas connection as this will be very reasonable to the people. In Varanasi alone the length of pipeline will be 800 kilometers which will be put under the plan to give benefits to about 50,000 households of Varanasi and nearby region. Approximate 20,000 vehicles for PNG and CNG correspondingly get benefited because of this project and hence reduced the pollution and solve the problem of fuel. Urga Ganga project would also allow the accessibility of approximate 5 Lakh LPG gas cylinders to the rustic population in the coming 5 years. Also constructing new 20 CNG station will be included in this project, owing to this around 2600 villages from more than 20 districts would be benefited on gaining CNG and also LPG gas under this new Urja Ganga Project. The new station will be positioned on suitable places where it doesn’t harm the peoples’ routine life. In UP length of gas line will be laid of the distance of338 KM, which will no doubt on fulfilling the requirements of public. Similarly, the Bihar statewill get around441 km gas pipe line under the Urja Ganga project, in which rural area also included. Jharkhand is a state in eastern India. Under the Urja Ganga project Jharkhand state gas pipe line length will be 500 KM, which will work for the growth of state. 20,000Vehicles will get CNG because of this project so lot of people will get work as CNG is cheaper than the diesel and patrol. Traffic problem will also solved out and people will also get rid from smell and pollution as supply of gas is underground. So this scheme will be very helpful for nature. The launch of the Urja Ganga project would not only ensure the household members health safety by providing clean fuel, but also this project helps to maintain eco-balance by making people to skip woods as their cooking fuel.